LATER this week, one of our spring rituals arrives: The Ojai Music Festival kicks off on Thursday. It’s always a good time up there, and this year we’re doubly excited because of the artistic directorship by pianist Jeremy Denk, one of my generation’s most imaginative players, a gifted writer of prose on his blog and elsewhere, and a great advocate for Ives. There’s always a lot to see at Ojai, but for now we want to talk about two performances by longtime jazz pianist and downtown experimentalist Uri Caine. Caine is aware that Mahler is not known for being light-hearted, and his music – even compared to other classical figures – doesn’t exactly swing. With all that rubato and agony, he’d not be the first to come to mind first for a jazz-oriented treatment. But he’s more complicated than his reputation, according to Caine. Mahler’s synthesis of different styles confused people at the time, Caine says, but his fragments and allusions make him in some ways a man for our postmodern times. Of course, the composer’s work is still not universally loved. “One thing people don’t always like in Mahler is that he goes off on some many tangents; he’s trying to develop so many different themes. As improvisers we do the same thing. Caine’s taste is catholic and wide-ranging, but that doesn’t mean he treats every composer’s work the same way. In fact, he insists that he pays enormous attention to the differences between each figure. “It has a lot to do with listening to the music, and then, like a student, trying to understand it. Letting the impressions dictate where you go with it,” observing the underlying structure, and then seeing what his bandmates respond to in their improvisations. Far closer to jazz than Mahler is the work of George Gershwin. Caine will also be reimagining the music of Gershwin, including Rhapsody In Blue, at Ojai. 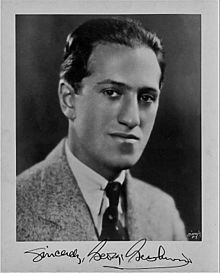 Gershwin was a bit like Mahler, he says, a synthesizer who brought a number of styles together – “Rachmaninoff, klezmer with the clarinet, a bit of Latin at the end. Like a lot of jazz musicians, Caine spent his early years jamming on the changes to “I Got Rhythm” and other Gershwin songs, so it was natural for him to come back to one of his earliest sources. “He was an amazing pianist, able to absorb ragtime and a lot of the New York players. You hear stories of him as a teenager, working for Irving Berlin – he was already a prodigy.” He differed from some of his contemporary songwriters in the Tin Pan Alley and Broadway orbits in being more steeped in jazz harmony, and by “self-consciously imitating a lot of classical composers – the Russians, the French – with added 6ths, added 9ths, moving by major 3rds.” And of course, much of his music drips with the blues. Caine laments that Gershwin, who left so many great songs – “They Can’t Take That Away From Me” and “Our Love is Here to Stay” are two favorites — died so young, at the age of 38 from a brain tumor. CultureCrash looks forward to seeing you at Ojai.